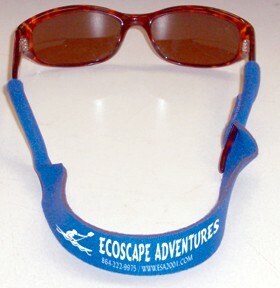 The classic soft and comfortable neoprene sunglass retainer. Keeps eyewear comfortably in place and secure. Black, Blue, Red, Neon Yellow, Neon Pink. Set-up fee: $40.00 (f) No set-up fee for exact reorders. Prices include one color imprint in one location. For each additional color, add $40.00 set-up fee and $0.40 each, (f) running charge. Designed twice asd wide as our regular sports cords. They are buoyant enough to float most glasses. The right choice for boating, fishing and watersports. The extra width is also great for imprinting your logo.